The Barbu d’Everberg is the rumples version of the Barbu d’Uccle. These two breeds are completely identical, except for the tail. Not a lot is known of its origin, but the first known examples were bred at Everberg in the year 1906, a small town near Brussels in Belgium, hence the name. The Barbu d’Everberg was never very popular and the breed had virtually disappeared by 1918. Gladly at present the situation has changed. Occasionally beautiful specimens of this rare breed are shown in the Netherlands and in Belgium, although the number of breeders is very limited. However, it now seems to be gaining popularity in Europe and the numbers, though still low, are growing rapidly. The colours and type are similar to that of the Barbu d’Uccle, but with a complete absence of tail and tail feathers. As with the Barbu D’ Grubbe the rumpless factor is dominant, though not completely in the Barbu d’Everberg. In some cases birds will be bred with rudimentary tail feathers. These birds should not be bred from or shown. The true Barbu d’Everberg should have a smooth, well rounded rump with no evidence of tail or feathers. 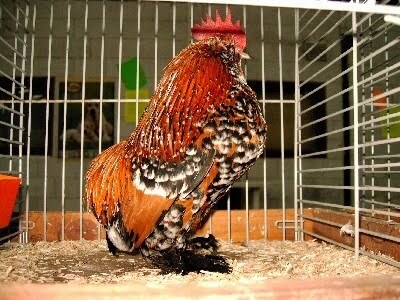 The Barbu d’Everberg (as are the Barbu d’Uccle) are susceptible to Marek’s disease, so breeders are advised to vaccinate their birds.